Our New York facility can handle anything from specialty couture pieces to large scale production. 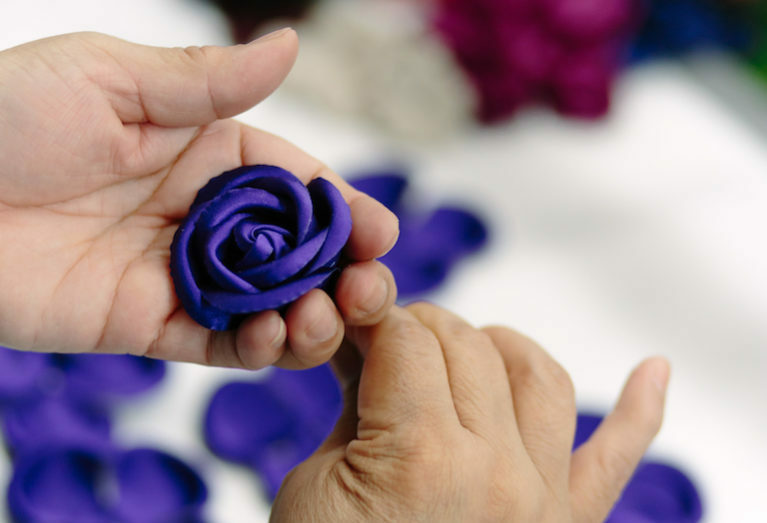 Whether we are making one silk fabric flower for sewing or a thousand, each flower will be made with care and quality. We are capable of quick turnaround times, flexible pricing, and customizability that cannot be matched. There are no minimums for wholesale production. Our design process can work in a number of ways. Designers have sent us actual fresh flowers from their garden to recreate, but we often work from design sketches or photos. Designers also visit our showroom and pick flower or petal samples from our vast library of styles and adjust them to their needs. We also have loose flower petals and many other molded die cut shapes, like butterflies and leaves, that designers can use to appliqué to their designs. We are happy to work with designers right in our factory. We are also happy take orders over the phone or email. If you’re looking to create custom fabric flowers for your designs, bridal accessories or styling pieces—we have the tools, technique and are ready to work with you! Call us at (212) 244-2090 or e-mail us today to discuss your collection.